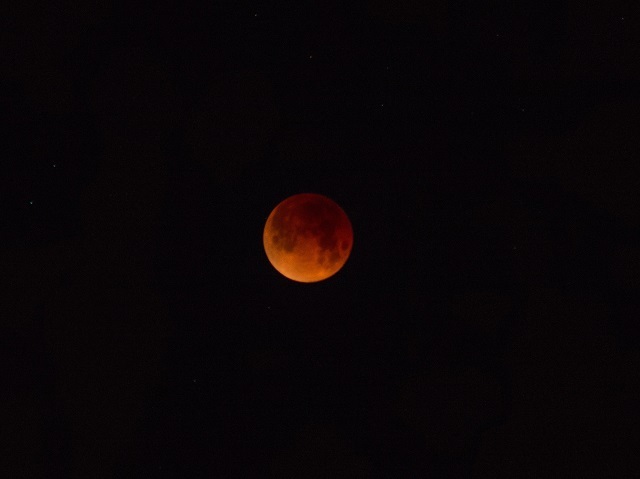 I took this photo of the blood moon this morning and I am finding many of my photos, especially landscape photos, have a significant lack of clarity. I'm not looking for a photo critique because I know this particular photo is crap. I'm looking to identify my source of failure to nail a significantly clear photo. White Balance: I manually set the WB to 5500 kelvin, it looked fine in live view. I turn on live view, and square up the target in the display. I then set my focal length, focus in using live view, adjust the focus as sharp as possible and take the pic. I've noticed that in this case, the picture was incredibly grainy, which doesn't translate to the final photo, but wonder if it has anything to do with it. This particular shoot I found it difficult to balance out the variables with a dark sky and a moving moon that starts blurring after 1-2 seconds of exposure, which is why I had the aperture wide open and the ISO cranked up. Equipment: The 70d takes great photos but the telephoto is not great when it's totally zoomed in. My wallet doesn't hold enough cash for a motorized mount to track objects in the sky. Circumstance: I've seen great photos of the moon with the use of a camera and a tripod, so I know this is possible. Although, I keep seeing pictures of this big gorgeous moon over the landscape, and when I use my wide-angle, the moon shows up as a dot. What the hell are people doing to get the moon so big? Beginner skill level: I know this is the biggest culprit, but being the beginner, I'm unable to know where to adjust. 1) The optical limits of your lens. The EF 100-300mm f/4.5-5.6 was released as a budget telephoto zoom lens in 1990 at the dawn of the EOS era. Compared to the current EF-S 55-250mm f/4-5.6 STM, at the longest focal lengths and widest apertures there's a significant difference in sharpness. Although not universally the case, most lenses designed and introduced during the digital age are better than their older film era counterparts, especially in the consumer and mid grade sectors. Manufacturers of the top tier lenses have also been forced to introduce newer versions of old classics. The new consumer lenses may not be as good as the old "L" glass (but sometimes they get close), but they are much better than yesterdays consumer lenses. Especially zoom lenses which have benefited tremendously from computer aided design and modeling. What used to take weeks or even months to test by making a physical prototype can now be accomplished in a few hours using supercomputer simulation. Digital sensors are perfectly flat. Film isn't. Some of the most expensive film cameras actually had mechanisms that created a vacuum behind the film to aid it in laying as flat as possible while being exposed. Even then, with color film the emulsion layer for each color was at a slightly different depth. So if focus was perfect for one color, it would be slightly off for the other two! Pixel peeping has raised expectations to a ridiculous level. Take a 20MP image and display it at 100% (1 pixel per screen pixel) on an ≈23 inch HD (1920x1080) monitor and the magnification is equivalent to printing at 56x37 inches! No one expected a 35mm consumer grade lens to be perfect at 56x37! But a lot of folks now seem to. The higher noise associated with using higher amplification (ISO) to make up for less light entering the camera, and the resulting noise reduction we use. 3) Atmospheric interference. If you were shooting from the location indicated in your user profile, the moon was fairly low on the horizon at the time. Just as the sun is much more distorted by the earth's atmosphere at sunrise and sunset than when it is high in the sky, so is the moon. Not only is the light having to travel further at an angle through the ocean of air surrounding our planet, but the temperature differentials near the terminator (the line between daylight and dark) tend to increase atmospheric turbulence in the times around dawn and dusk. 4) Letting the camera make all of the decisions about how to process the raw data from the sensor. This is particularly the case with a dim object, such as the moon during totality, that is moving across the frame. This limits our exposure time. Most great moon photos (when it is not in the earth's shadow) you see are saved in a raw file format and post-processed to fine tune the contrast between darker and lighter areas on the surface of the moon. Color temperature and white balance adjustments, sharpening, and in some cases even digitally applied color filters, can bring out the contrast between different areas of the moon. This is even more critical when the photo in question is taken during a total eclipse. 5) The noise reduction applied to using ISO 1000 with a Canon EOS camera. I'm a Canon shooter because, overall, Canon works for what I do. Every system, though, has advantages and disadvantages. One of the things where Canon falls a little short is in the way their cameras handle the "partial" stop ISO settings. For a comprehensive look at how Canon cameras handle the "partial stop" ISO settings and why using the "+1/3 stop" ISO settings (such as ISO , 250, 500, 1000, 2000, etc.) can make your photos noisier than other ISO settings that are even higher, please see Is it really better to shoot at full-stop ISOs?. The amount of NR the camera applies to ISO 1000 by default will reduce the detail in the image. ¹ Back near the beginning of the consumer digital SLR era, APS-C only lenses were often marketed as "digital" lenses. ² The moon moves roughly 1/2° less per hour than the stars as viewed from the earth's surface. That also happens to be approximately the moon's angular size in the sky. So for a one second exposure, the moon would move across the frame 1/3600 of its own diameter less than the nearby stars would during the same exposure. ³ This article from Space.com says anywhere from 10,000 to 100,000 times dimmer, depending on the earth's atmospheric conditions. That's between 13 and 17 stops darker than a full moon! My wallet doesn't hold enough cash for a motorized mount to track objects in the sky. Depending on your willingness, desire, and/or ability to take a DIY project, that is not necessarily true. A barn door tracker can be made very inexpensively. However, for stable tracking when using a long focal length, you'll definitely want the tracker motorized and timer controlled. Even a basic, simplest tracker design will improve your results. But for longer exposures, and especially when using longer focal lengths, they can still leave you wanting more. In those cases, you need to be aware of the errors introduced by the barn door design's geometry, such as the so-called tangent error that gets worse the longer the tracker is running. These errors can be mitigated to varying degrees with modifications to the geometry (depending on which design was chosen (as shown in the Wikipedia link above), or with nonlinear rate control of the lead screw motor's speed. Paul Cezanne's answer to Which tracking motor to use for low-end wide-angle astrophotography? Not the answer you're looking for? Browse other questions tagged astrophotography moon or ask your own question. Is it really better to shoot at full-stop ISOs? Will a focal length reducer help me image deep sky objects using an 8" newtonian telescope?